AzhwAr mentioned about a benefit which had no equivalent. Is this all that emperumAn does for his followers? Till such time that they are here, without any regulations about what he does, emperumAn carries out all the protective actions; if the follower leaves this body, he gives him svarga (heaven); more distinguished than these, he also grants paramapadham (SrIvaikuNtam); even after granting all these, isn’t he the entity who feels sad that he has not done anything for his follower? AzhwAr thus explains in this pAsuram, the meaning that he had given in the previous pAsuram. vEndharAy – being like kings who will function such that the strong people do not harm the weaklings, so long as they are in this world. Has it not been said that kings are denomination of bhagavAn, as in the saying “nAvishNu: prithivIpathi:” (king is not different from vishNu) and in thiruvAimozhi 4-4-8 “thiruvudai mannaraik kANil thirumAlaik kaNdEnEyennum” (if she looks at the king, she will say that she has seen thirumAL (emperumAn))? viNNavarAy – Is it not true that even if kings rule the land properly, if there is no water resource, there will not be any benefit to the people? Hence, (emperumAn functions as) being the celestial entities who are the cause for rain which provides water resources to people in the world. vyAsa said “sarva ijyAScha krishNa:” (all celestial entities are krishNa). thaNNaLiyAy – being the grace showered by indhra et al celestial entities. The opinion here is that it is only emperumAn who grants happiness through indhra et al in svarga. emperumAn said himself in SrI bhagavath gIthA 7-22 “labhathE cha thatha: kAmAn mayaiva vihithAn hi thAn” ((AthmA) attains all the desires which are granted only by me through celestial entities). mAndharAy – being relatives and friends who provide help. 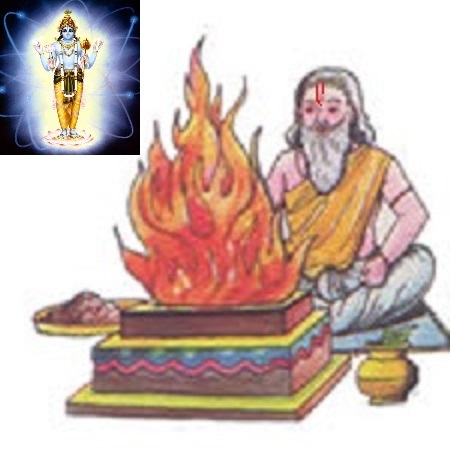 subAlOpanishath says “suhruth gathir nArAyaNa:” (attain nArAyaNa who is good at heart). mAdhAy – being the mother who gave birth to. This applies to father too. Just as it is mentioned in the saying “sahasram hi pithur mAthA” (being thousand times greater than father and mother) mentioning mother is also applicable to father. periya thiruvandhAdhi 5 says “peRRa thAy nIyE piRappiththa thandhai nI” (you are the mother who gave birth to and the father who was responsible for the birth) and subAlOpanishath “mAthA pithA nArAyaNa” (nArAyaNa is the mother and the father). mAdhAy – also could be construed as being beautiful. mAdhu – beauty. It is emperumAn’s beauty which the AthmA enjoys among all the beautiful things enjoyed.Hasn’t emperumAn himself said in bhagavath gIthA “yadh yadh vibhUthimath sathvam SrImadhUrgithamEva vA I thaththadhEvAgachcha thvam mama thEjOmSa sambhavam II ” (know that all the materials which are full of opulence, which are beautiful, which are firm are born out of my radiance) and nammAzhwAr in thiruvAimozhi 1-2-7 “adangezhil sampaththu adangakkaNdu Isan adangezhil ahdhenRu adanguga uLLE” (after looking at all the beautiful wealth of emperumAn, one should realise that he is also one among his wealth and become humble)! For whom is emperumAn like these? sArndhavarkku – he is like these for those who attain him. than ARRAn – being dissatisfied with himself for not having done enough for his followers despite doing all these. Isn’t he the entity who says as in mahAbhAratham “gOvindhEthi yadhAgrandhath krUshNA mAm dhUravAsinam I ruNam pravrudhdhamiva mE hrudhayAnnApasappathi II ” (the crying out of dhraupadhi who cried out gOvindhA when I was at a far away distance is not leaving my heart just like a loan which has kept accruing interest)! nEmiyAn – one who manifests himself with his divine disc which removes enemies and which enables his followers to enjoy him. mAl vaNNan thAn kodukkum – being the epitome of affection, one who keeps giving benefits like the above despite saying that he has not given anything. It is proper for emperumAn to grant mOksham for his follower. But is it proper on his part to grant happiness in this world and svarga? Since he is sakalapalapradhan (one who grants all benefits), it is not wrong on his part to grant other benefits too, based on the desire of his follower. For the sake of pirAtti (sIthAppirAtti) when jatAyu gave up his life, not knowing what he is doing, did SrI rAma not grant everything without any distinction between the pleasures on earth and mOksha as mentioned in SrI rAmAyaNam AraNya kANdam SlOkam 68-30 “yA gathir yagya SeelAnAm AhithAgnEScha yA gathi: I aparAvarthinAm yA cha yA cha bhUmippradhAyinAm I mayA thvam samanuggyAthO gachcha lOkAnanuththamAn II” (For those who observe rituals, for those who carry out rites with fire, for those who donate land and for those mukthas who do not return here ever, whatever great benefits are granted, you too, who are directed by me, will enjoy all those benefits in all those worlds )! We will take up the 84th pAsuram next. This entry was posted in iyaRpA, nAnmugan thiruvandhAdhi on September 10, 2018 by T N Krishnan.